The famed yet flawed Colonial portrait painter Gilbert Stuart was known throughout the colonies as an exceptional artist who could capture a likeness. His hand was deft and seemingly flawless in technique. Asked about his process, Stuart remarked: “Paint what you see and look with your own eyes”. As you examine work by Stuart, how would you interpret this statement by the artist? Does it have any special meaning to you in your development as an artist? I think what Gilbert Stuart wanted to spread across with his statement was that he was not trying to exaggerate or make his portraits look heroic or alter them in some way. He was being true to reality and painting what he was simply seeing with his “own eyes.” It is rare to see art that is true to reality, especially with the development of technology and computerized images. Models get Photoshopped and turned into this surreal idea of perfection that does not exist in the world. What I would carry from Stuart’s example is to stay true to realism because reality can also be beautiful. Seeing with your own two eyes is a step forward, but trying to understand and move beyond the trappings of portraiture conventions is another thing. These painters we have been looking at have given us a fresher approach to portraits, but they are still well within the expectations of the audience. Looking to nature has been a trend seen throughout history. Art may fluctuate between realism and idealism, but that is not very new. It seems like every survey course I have taken includes a period of drawing from live models for inspiration and a period of drawing from classical examples. Inventing a new language and developing a new form of expression is hard and rare. It is those innovators who become influential and are immortalized in our textbooks as “the first” or “the best” examples of their time. These questions on portraits are nice, but are becoming a little too close to the paper topic. I know that I will include the issues raised in this post in my opinion paper… when I get around to writing it. Stuart’s response to his process at first seems to apply to the technical side of painting. To truly look at something and the way that it is shaped is harder than it seems because of misconceptions about how a subject ‘should’ look like. But it can also be applied to the general aesthetic and idea behind the painting. His subjects have that sense of unpretentious dignity that is prevalent in Colonial American art and that ties back to the idea of questioning what a subject should look like. Rather than taking an idealistic or dramatic approach, he took a realistic, sincere approach, only painting what he was seeing with his own eyes. “paint what you see…” paint what is before you. “….see and look with your own eyes” see the subject before you through your own interpretation and not through the eyes of previous artists. This is a simple idea but hard for many artists to accomplish. Many artists look to old techniques as the right way to portray sitters instead of reflecting a mirror image or using their own unique respresentation. It wasn’t for many years that artists became comfortable portraying pure non idealized portraits, let alone one that isn’t realism or idealized but instead, the use of pure artistic license. We all view the world and individuals differently. what I see in someone may differ from what you see. This being the case…I am able to portray someone through my own eyes that may not be what you see. This still makes it a portrait and it also makes a true reflection for me even if it doesnt represent the individual for others. I think what Stuart was trying to get at was that he doesn’t let the influence of past painters or the expectation of the way something should look get in his way of what he sees when he is painting a portrait. For so long, portraits were designed to make the sitter look their best, with their finest possessions on display. Stuarts portraits are real. He paints what he sees before him without trying to “glamorize” the people he paints. Unless, of course, the person is of a high social standing and can’t be portrayed any other way. I think that is a great quote for all artists to remember, especially coming from a painter. Everybody has a different style with painting. No painting can be exactly the same, and that is what makes paintings so wonderful. The more individuality put into a painting the more special it becomes. Everyone will look at a subject completely different and to paint what one sees leaves the painting with character. Gilbert Stuart, a very talented colonial painter, was acknowledged for his realism in portraits. When Stuart said, “Paint what you see and look with your own eyes,” I believe he meant to paint exactly what you see. However, I think there is also a much deeper meaning. People do not perceive everything in the same manner, as we are all different and have different beliefs, attitudes and approaches. As an artist, I believe you should be true to yourself and paint from your own perspective and interpretations. Personally this statement holds very little value to me. Every artist is already doing this in a very literal manner. I think what he is trying to impart is to be aware of the subject. Most aspiring artist tend to draw or paint the likeness of an object; what that object OUGHT to look like. Instead, what needs to be done is to draw the shape, the lines that make up this object. For example: a person drawing a pear is so intent on getting a nice ‘pear’ shape or what it SHOULD look like that they do not pay as much attention to what the shape is REALLY like. A person just looking at the shape n form of the pear will probably be able to capture the subject in a more convincing manner. This might be his technique; combine with his innate artistic ability, he can capture the likeness of his subjects. I think that Stuart’s quote “Paint what you see and look with your own eyes” is advice that the artist genuinely practiced and believed. His work, for example “Mrs. Richard Yates,” is known for capturing the moment where the subject has taken a split second from sewing to sneak a peak at the viewer. He was a master at showing the animation and life in portraits unlike earlier paintings, such as “Elizabeth Freake and Baby Mary,” in which there was a huge lack in personality. I think a lot of the reason he had such success in capturing the presence of subjects is because he truly painted what he saw. In our text book it talks about how he liked painting portraits because he could do it so quickly, and I think that relates to the quote because instead of trying too hard he simply followed his eye and it led to great work. When I try painting portraits myself it takes a long time because I’m always trying to make it perfect and really capture the person, so maybe his advice is just what I need in that I have to loosen up a bit and just follow my eye. Maybe the quick, “sketchy fashion” that he used would be a more beneficial technique. I think that he means to use “your own eyes” in order to produce a painting with individuality. Each painting of each person is painted in the artists style while capturing the subject’s energy. I believe Stuart meant that if you are going to paint or draw you must be able to do so in your own way without having to get caught up in what everyone else is doing especially if everyone is painting or drawing the same subject as you. Art is about putting your own mark on a subject, whether its difficult or easy, for you are creating something with your own eyes that would never be captured by anyone else. When I read this statement by Stuart, I just think what my own art teacher’s have told me. “Paint what you see and not what you know.” Basically, use your eyes and see what is actually what you there and not what you think is there. If I was an artist, this would be helpful because if you paint what you see and what you know, you wouldn’t have a very good painting. It would confusing and chaotic. But as I am not an artist, I don’t you use if very often. I must say that I am the worst at “paint what you see and not what you know.” I am constantly doing portraits for people and I do the general person and then when im filling our the shades and values I tend to do it the way I think it should be rather then referring back to the image to copy exactly where the shadows are. Gilbert Stuart’s statement does have special meaning to me as an artist. “Paint what you see and look with your own eyes” simply means to paint exactly what you see. I am much better at painting something that is directly in front of me rather than painting from memory. He expresses not to add in fantastical things to make the person look better. When he says “your own eyes” he means to paint with the person in front of you, not from someone else’s painting because then you would be painting what the other artist saw through their eyes. ”Paint what you see and look with your own eyes” – a very simple yet powerful statement that encourage artist to explore one’s inner self and the true meaning as an artist. Individual’s ideas and themes in an artwork are what Stuart embraced I suppose. And because of that, we could see the true beauty and wonder of creativity from an artist. I agree with the phrase that Dutch pointed out above: “Paint what you see and not what you know” because we often feel uncomfortable with changes that limit our creative thoughts. I think it is funny because time and time again I get friends who say that can’t draw. I as well could not draw to save my life before I took a drawing class. But now, after hearing others say they can’t draw, I reply with, “Trust me. Anyone can draw. Ultimately, the trick to drawing is that you can’t fake it. You can’t draw what you think, but you have to draw what you see.” Stuart’s statement completely parallels to what I would usually say on a daily basis. It is true, in order to draw, paint, anything, you have to capture what you see. People have a tendency to draw from knowledge and what they think is supposed to be there. But honestly if one just stays true to what is right before their eyes, they can achieve a true likeness. This statement may have been said to suggest painting the object for what it is and not an idealized version, but I also think it could be read another way. To capture the subject one has to “look with your own eyes”, Stuart’s eyes have been trained to latch onto the subtle differences that makes each portrait an individual. The object may not vary, but each person’s take on it may. After many drawing and painting classes where multiple students have to do the same still life or figure, it’s always amazing how each painting or drawing still vary. Yes angles may be different, but lighting and colors are also different from student to student. Stuart saw his subject with his own particular way, yes he captured likeliness but he also captured his view. I think this quote deals with the difference between physically looking at something versus seeing and absorbing what lies beneath the surface. It reminds me of the difference between listening and hearing in term of music and communication. I think Stuart means that in order to capture likeness and physical qualities you just need to look at the subject, but to know them and paint them as an identity you need to look beyond the surface of the skin and spend more time identifying the details or subtle expressions. As I am not an artist, I can relate this to my life as far as problem solving and critical thinking — the difference between finding one solution and the possibility of improvement or more beneficial results through other avenues beyond just one problem. The statement that Gilbert Stuart made is something that I have been learning over the past couple of years. When we are children we try to draw someone based off of the outline of them. Somewhere along the way we start to distort features of the face and figure. What I have learned in the past couple of years is that if you look more at colors and shapes then it seems to come out more realistically. Because if you think about it that is all we are. Different shapes with different shades of color. I think another meaning for his quote goes a little bit deeper. It is not merely the physical appearance but he is also talking about the spirit of each person. Like the Portrait of Mrs. Richard Yates for instance. When you look at her face it is not simply just a face. She is making an expression. We can tell that something is going on in her head. It is almost like she is telling us that we are interrupting her sewing. In order to create an exact likeness you must capture the sitters attitude as well. Stuart did an excellent job when he did her portrait. I believe he is saying that when depicting a subject through art it should be done through what the artist sees in the subject and not through any public perception or how the subject ideally views his or herself. 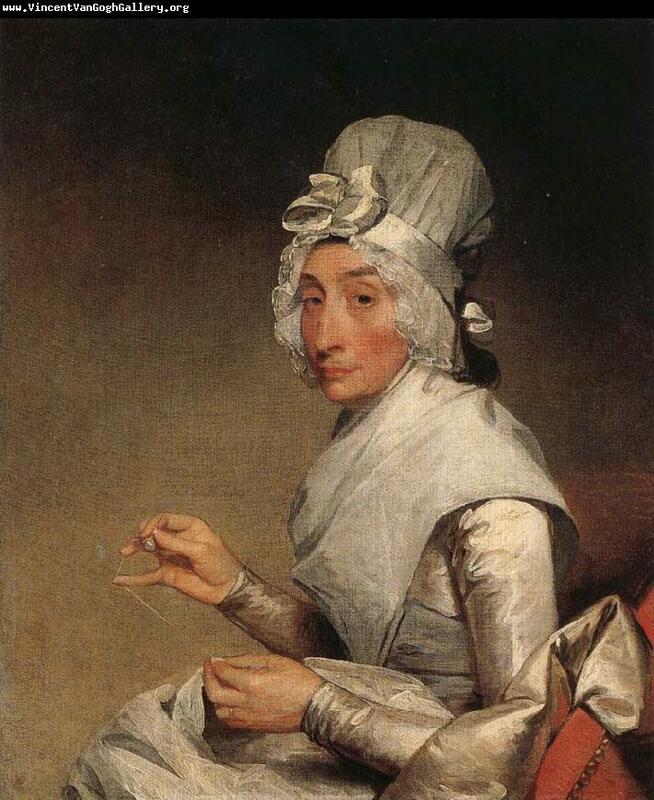 In the Portrait of Mrs. Yates, Stuart paints Mrs. Yates in the process of sewing; either an important hobby or occupation for Mrs. Yates which helps to describe her character. She’s portrayed doing something she does often and is familiar with which aligns with Stuart’s philosophy of painting what you see in a person. I respect Gilbert Stuart for his honesty. The fact that he was always struggling to earn a living and decided on portraits because he could complete them quickly is an attribute of artistic wisdom. Gilbert chooses to capture the tension in her hand gesture. He paints her with a stern delicacy that can be understood through his choice of soft yet persistent glair. Gilbert painted selectively. By doing so, his paintings are compositionally simple yet are inviting. His choice to paint selectively is his way of paining with his own eyes. I respect his work for this very reason. My development as an artist is all encompassing. I hope I never stop developing. I might not ever fully arrive. I say this because the instant I say that I have arrived, is the very instant I stop growing. I never want to stop growing. I value Stuart’s statement because it is far too easy to be someone’s artistic puppet. I am no one’s puppet.